A silver part table canteen, Top comprising of twelve silver teaspoons, twelve table knives, twelve desert knives, twelve silver fruit knives, twelve silver fruit forks, twelve silver fish knives, twelve silver fish forks. Two carving knives, two carving forks and sharpener. 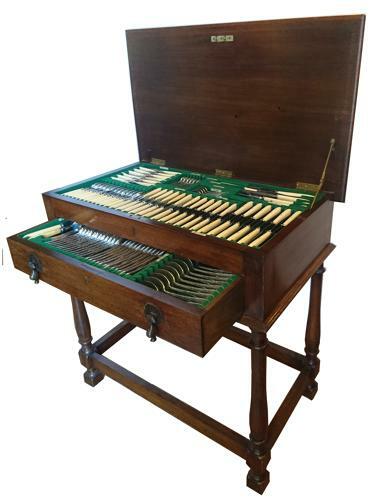 Lower drawer containing twelve silver table forks, twelve silver soup spoons, twelve silver dessert spoons, two silver sauce ladles, a silver soup ladle, a pair of silver fish servers, six silver table spoons, two silver serving spoons. The silver is hallmarked Walker and Hall, Sheffield 1914. Contained within a fitted lockable oak table with brass drop handles, pull out front draw and hinged lid. Width measuring 76 cm, height measuring 75 cm), depth 45 cm. Gross weighable silver 6 kilogram approx.